I was looking for "Трёхконтурная система зажигания" but did found nothing and was pointed here. All day was reading secu information, but got not much smarter. I have volvo 164 Year 1969 engine b30a with 2 carbs . its strait 6 cylinder. generally its equal vaz classic but 2 cylinders more. and Ill use LPG. Please help me collect right items for setup. As far as I understood you plan to build ignition with "wasted spark" configuration. What other devices you plan to control on your engine using SECU-3 unit? Yes , I want wasted spark. I need impulse for tachometer. That s i guess it. Do you know which type your tachometer is? Low voltage or high voltage input? If it is connected to the ignition coil, then it is high-voltage input. I guess it is low-voltage input. 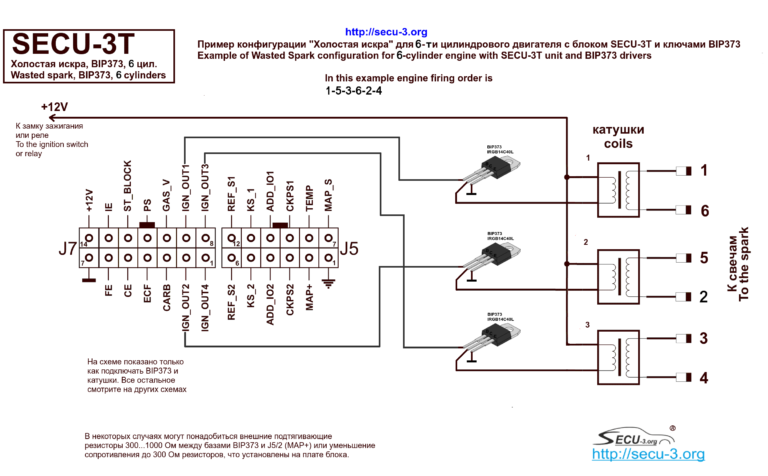 For wasted spark ignition control and output for tachometer you need SECU-3T unit and 3 BIP373. You will reassign any free SECU-3 unit's output to HALL_OUT and it will output pulses for your tachometer. IE and FE outputs are high-side and 12V, others are low-side and 5V. It is a throttle position limit switch. You can use either simple limit switch or TPS. ok. if I have 2 carbs i use only one tps? The rest I figured out correct? or I missed something? can YOu make diagram for my connection case. non of them mach for me from samples? No. There are a lot of wiring diagrams for SECU-3T unit on the our site. Take a look of them http://secu-3.org/wiring-secu-3t/?lang=en If you need, write your own diagram and show us, so we can find possible mistakes. Our site is fully translated to English.